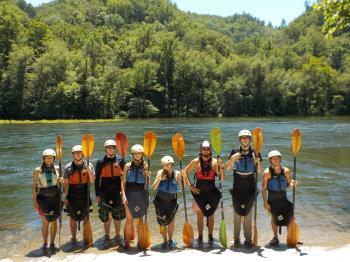 Kayak adventure is the perfect camp for any high school camper that wishes to learn more about kayaking. This camp is designed for kayakers of any experience level. The week will begin with a day at camp practicing strokes and maneuvers in Camp Lookout's pool and lake. After our practice sessions at camp, we will progress to three exciting days of whitewater paddling and camping at areal rivers. Whitewater Kayaking II (Grades 9-12) begins Monday 9:00 – 10:00 a.m. and ends Friday with a 2:00 p.m. closing.